Hundreds of Central Baptist College alumni, friends and prospective students flocked to campus to enjoy Homecoming festivities in February. Homecoming activities began on a Friday evening with the Singers Meet and Greet in the Story Library. Previous and current members of the Central Baptist College Singers came together for a time of fellowship. The highlight of the event was when Jim Courtney entered the event to a thunderous round of applause. He founded the CBC Singers in 1969. On Saturday, nearly 100 endowed scholarship donors and their student scholarship recipients came together for a breakfast. During this event, donors and students were able to come together so that students could thank their donors and donors could learn more about their scholarship recipient(s). For the 2018-2019 academic year, 82 endowed scholarships were awarded totaling $45,800. The Burgess Auditorium was a packed house for the Central Baptist College Singers 50th Reunion. A special thanks to the 50th Anniversary Singers Planning Committee for their hard work on this event: Danny Fagala, Jana Rice Hefner, Stacy Courtney Jordan, Phillip Rice, Chuck Sullivan and Jim Turner. The 2018-2019 CBC Singers provided a flashback to 1984 to begin the event. Current CBC Singers Director Jim Turner welcomed attendees and introduced the program. The event included performances from Singers from 1969-1972, led by Mike Nix; the 2018-2019 CBC Worship Choir; and the 2018-2019 CBC Singers. More than 150 were in attendance for the Alumni and Friends Luncheon, held in the Mabee Student Services Complex. The Central Baptist College Alumni Association presented awards. Judy Gabbard was honored with the Distinguished Alumnus Award for her 50-plus years serving as a faculty in the Science Department at Central Baptist College. Andrew and Elizabeth Gunnels received the Outstanding Young Alumnus Award. Shannon Riner was honored as the recipient of the Mustang Community Impact Award and Jerry Bowling as the Ambassador of the Year. Also recognized were recipients of the Kenneth Brown Endowed Scholarship, Coby Harvison, Sydney Hawkins and Katie Vandergriff. The Alumni Association presented a $1,000 donation to this endowed fund. 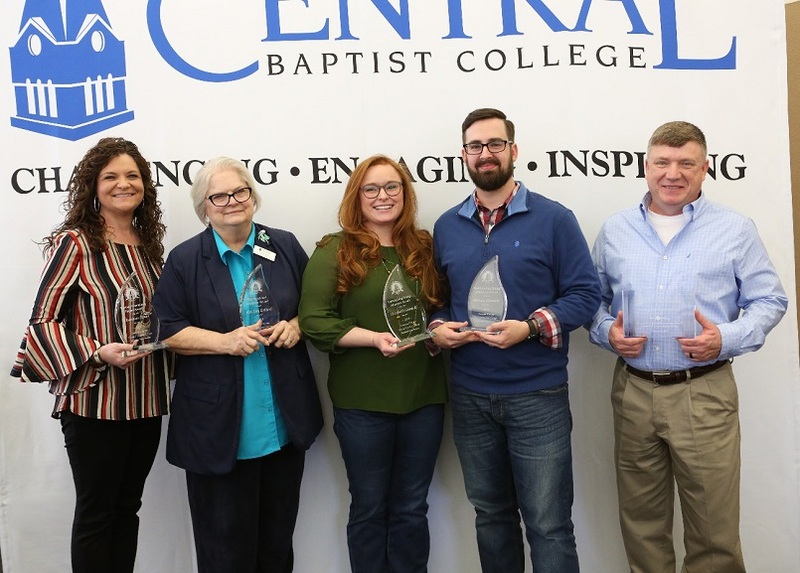 Central Baptist College Alumni Association Award Recipients Shannon Riner (from left), Judy Gabbard, Elizabeth and Andrew Gunnels, and Jerry Bowling.